The Gweek Players are a theatre group based in Gweek but drawing members from a wide area. 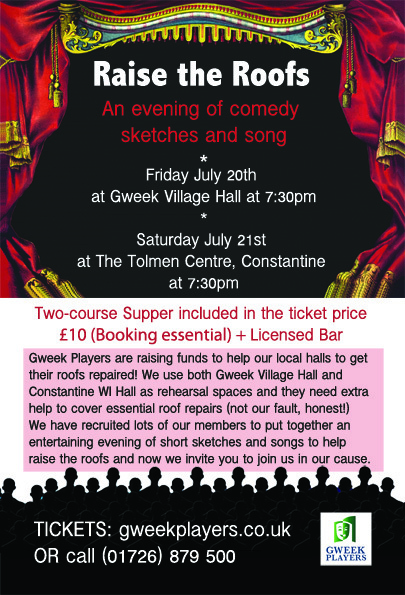 For rehearsals and performance we use Gweek Village Hall with its excellent stage and dressing room facilities. We have very good audiences on our 3 night runs. Our latest innovation is Theatre with Dessert – in the interval our audience enjoys a choice of scrumptious desserts. This has proved immensely popular and has become a unique feature of our performances. As a group we have a good social life. There is the annual barbecue on our ‘birthday’ in July and a winter get together which is sometimes Burns Night – or any other excuse we can find! Obviously there are also the refreshment breaks at the rehearsal or the pub afterwards.